Following on from the previous thread, I’ve just bought a ‘98 C2 Tip. On the way home from the sale, 2 litres of coolant simply disappeared. No sign of leaks, drips, white marks, tho there was a faint smell of coolant from the engine area. Word back from the garage today is that they pressurised the system and cannot find a leak. I’ve asked them to take the PU off and inspect the rads, clear debris etc, which they’ve done. They tell me the rads have recently been replaced. Was the system just not pressurised enough? PS , some pics are due I suppose... very happy with how she has weathered her years, no rust to speak of, a little surface only on the radiator brackets, this being sorted and protected. If the rads had been replaced in say the last 20 miles then an airlock is possible .. if we are talking a couple of hundred then no . car at temp .. a/c on so the fans are running .. smell the air flow from each rad .. a sweetish smell indicates a slow rad leak . No external leaks so its just about possible its internal .. to the car that is .. any sweetish smell inside the car .. carpets damp in the front footwell either side .. heater matrix is what i was thinking .. long shot though . Rad cap is blue .. any white crusty stains on the edge .. this would indicate a new cap is needed . They look like secondhand rads? Looks like the number 130 is written on one? Great to get professional advice from you DeMort, very much appreciated. A couple of hundred miles at most, and then it’s been only a few miles every 3-4 weekends. The fans are working on low with ac on. No smell of coolant up front or in cabin but there is a smell of same in the area of the header tank. However the pressure check showed no leaks! Could the leak need higher pressure?! Also, no sign of white staining on cap but it’s a .00 so there’s a new one on the way, with a low temp thermo for good measure. 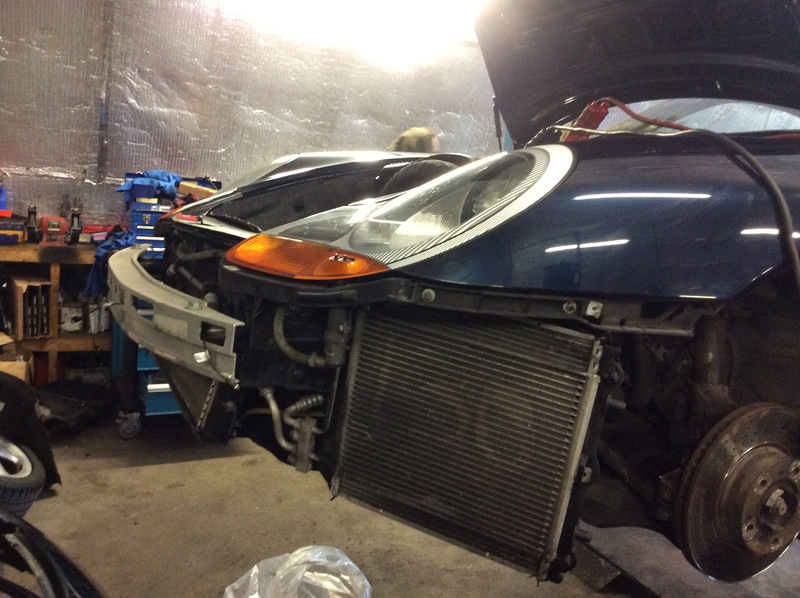 The engine compartment fan was recently changed. I’ll take your advice DM and run her , with a gallon of coolant mix sitting behind me! I’ll keep the thread updated. If your useing a pressure tester then it will have the green to red colours on it .. dont go very far into the red as you are going beyond what the car will do . I think its about 20 psi on our tester .. a little into the red basically and thats as far as i go . Coolant tank splits along the seams but should show up on a pressure test .. not a leak ( depending on coolant lvl ) but a loss of pressure when left for 20 mins on the tester . For now you just need to do a few miles to see if its actually got a leak i feel . Thank you very much for that valuable advice DM, I’m hoping to get the car back tomorrow, I’ll put it thru it’s paces and report back. I may be wrong but the problem with the tester is it doesn’t reproduce the situation where the hot coolant expands pipes and joins. Having read a few more of your posts, I’m going to prioritise waxing the car underneath, so thanks for that pointer too. watching this thread with great interest, I’m having exactly the same problem. Using about a cup full of water every 200 miles and no idea where it’s going. I have similar problem, my leak is on aluminium pipe where joints with rubber pipe very small usually is nothing on floor as when you driving air is pushing away all drops, you will have to check under car all connections, also I have read about GT3 problems with pipes popping out from engine I don't know if this is an issue in standard models so advise from expert like deMort more then welcome. Mine was easy to find as white shite build up around it. I have the boys at the garage going over the coolant pipes this morning with particular attention to the crossovers. If they’re in good condition they are going to get a lovely coat of wax. Will report back once I’ve the car back and a few miles put under her. The way i test with the car hot is a bit iffy so i dont really want to explain it .. so ill say this .. If you run the car upto operateing temp from cold .. the system will have as much pressure in it as its ever going to have .. so you are in effect pressure testing it just by running it up. 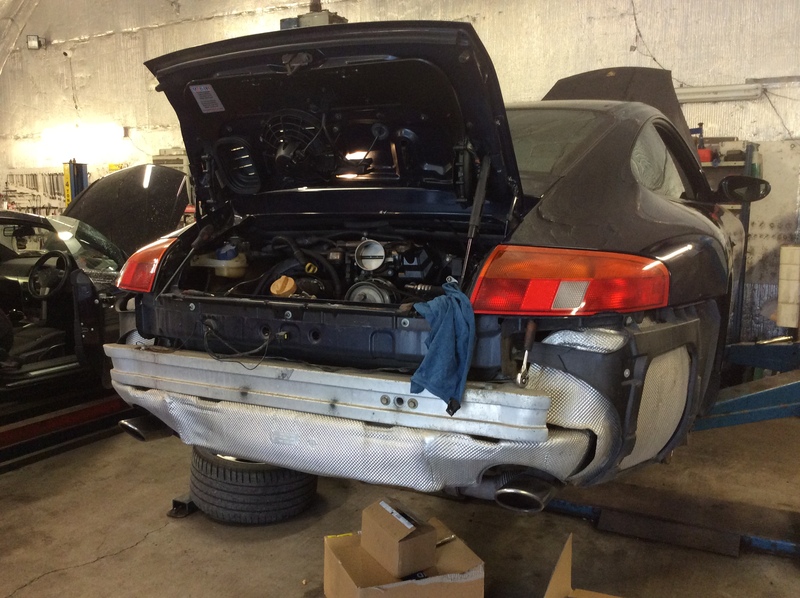 996 dont have crossover pipes as such like the 997 but theres plenty of pipes for them to look at lol . That fault wont happen on a 996 C2/4 . Well I don’t think the news is all that great ..
All was wrapped up with the car this evening. I went over to pick it up. The garage had brought it up to temperature and then sat it running as a last test. All good, until it suddenly spewed the guts of s litre of coolant out thru the coolant cap. The dash temp was at about 100 degrees st this stage. Half way between the two dashes. I’m hoping it just hasn’t been ‘burped’ properly, but it still doesn’t explain the first loss of coolant. Pissed off and getting stuck into a bottle of Gordon’s. This is no way to start back into 996’s. Did you have the coolant cap set to let out the air, it shouldn't really let out coolant. I’m not sure what’s going on with that cap but there is a replacement on the way. Ok so not brilliant news .. It lost coolant driving back from were you bought it ( private sale ? ) and it over pressurises when run upto temp. The temp .. 100 is too high for a car at idle so you have a fan issue or you have a coolant circulation problem .. there is one other but ill leave that till the end. Lets say there is an airlock .. coolant wont circulate and it will over heat .. that will push coolant out the cap . A faulty water pump or thermostate will do the same . A faulty cap .. basically not holding pressure will do the same . The last one .. which you dont want to hear is a headgasket failure and having x2 headgaskets it might be tricky to find which one . I will say its very rare , in fact i havent seen one go this way .. when they normally go it lets coolant into the engine and you get D chunk ... again ive only ever seen a handfull in nearly 15 years . First thing is replace the cap .. and get the system bled out. Then get your garage to do a "sniff test " .. its a device that detects combustion gasses in the coolant ... if this is ok then thermostate / water pump is were i would be looking next and im kinda leaning towards these due to the temp the car got to ..
Btw .. 100 is not an over heat .. 120 is ! .. 100 is also the boiling point of non pressurised water !!! Sorry for the bad news but i always try and list out what a fault can be . Anything less than that is a bonus. The coolant has been flushed. The garage used a vacuum system tho they did NOT do the 4K revs to run any last air out. This needs to be done. The thermo has just been replaced with a low temp item and the garage confirm that there was a temp drop when the thermo opened. The other thing that needs to be confirmed is whether there’s a blockage at the rads. The garage have IR equipment to check these. They say they’ll also check the coolant for CO2. By the way the engine runs really smoothly, so unless it’s very early D chunk I’m hoping it’s the other minor problems. As always, it’s most kind of you to spend time advising. Will update when I hear word. You either have D chunk or you dont .. its a big bit of the cylinder wall missing basically .. and a wrecked engine so its not that . Its also not an engine failure .. i NEW you would be thinking that .. im happy to give you my number and we can chat on the phone if you want . 3K revs is all thats needed .. engine will be cold at that point so thats plenty . Rad blockage .. new one on me if so . Water pump .. the impellar can wear or indeed break off .. this WILL cause the issues you have . I would still lean towards this as it fits the symptoms . If you want to go the worst possible way atm then headgasket but if it is this and a sniff test will soon confirm then its a new one on me ! Thanks again , most helpful and dare I say it upbeat! I’m going to start with asking them to bleed if they haven’t done so, stick the new cap on and work from there. Ive got my fingers crossed young man .. although to be fair i dont think its a major problem atm .. looking forward to seeing what they find .